Bengaluru: Two Independent MLAs, H Nagesh and R Shankar, on Tuesday withdrew their support from the ruling Congress-JDS coalition government in Karnataka. “Today is Makar Sankranti, on this day we want a change in the govt. The govt should be efficient, so I am withdrawing my support today,” said R Shankar. “My support to coalition govt was to provide good and stable govt which utterly failed. There’s is no understanding among coalition partners. So, I decided to go with BJP to install stable govt and see that govt performs better than the coalition,” said H Nagesh. The development comes a day after media reports claimed that six to eight Congress MLAs are ready to cross over to the BJP and some lawmakers of the ruling coalition have gone incommunicado. While the BJP flew its 104 lawmakers to Delhi and later to a resort in Gurugram on Monday, the Congress-JDS accused the former luring away its MLAs offering bribes and other allurements. However, BJP state chief B S Yeddyurappa rubbished reports his party was attempting ‘Operation Lotus’ to topple the state government. ‘Operation Lotus’ is a reference to BJP’s alleged bid to lure several opposition MLAs to defect to ensure stability of its then government headed by Yeddyurappa in 2008. He said there was no truth in the charge and instead alleged that the Congress-JD(S) combine was trying to woo his party MLAs. In the 224-member Assembly, BJP has 104 members, Congress-79, JDS 37, BSP, KPJP and Independent one each, besides Speaker. BSP, KPJP and an Independent are supporting the coalition. 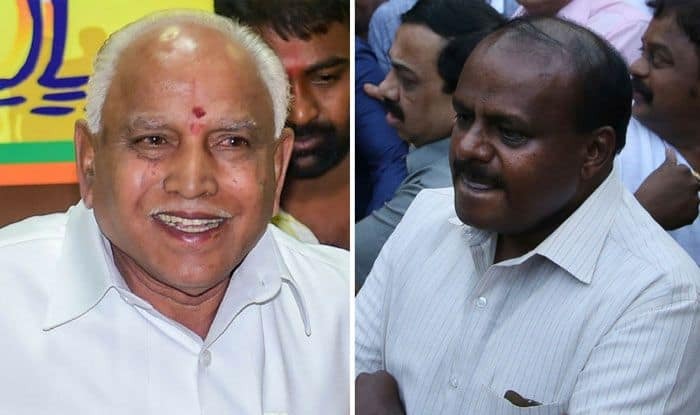 Kumaraswamy said he enjoyed the support of 120 MLAs and alleged that Yeddyurappa was making “futile attempts” to destabilise his government. Shivakumar on Sunday said the BJP’s ‘Operation Lotus’ was for real, alleging that three Congress MLAs were camping in a Mumbai hotel. He had said the chief minister was being “lenient” towards the BJP, by not exposing it. “BJP members have gone for their executive meeting and to plan a strategy for Lok Sabha polls to win more seats. What should I do if their meeting is being seen as a threat to this government?” the chief minister asked.